1ST ON FRONT is a monthly event that takes place on the First Friday of May, June, and July. Click the dates below to view our official event pages on Facebook. 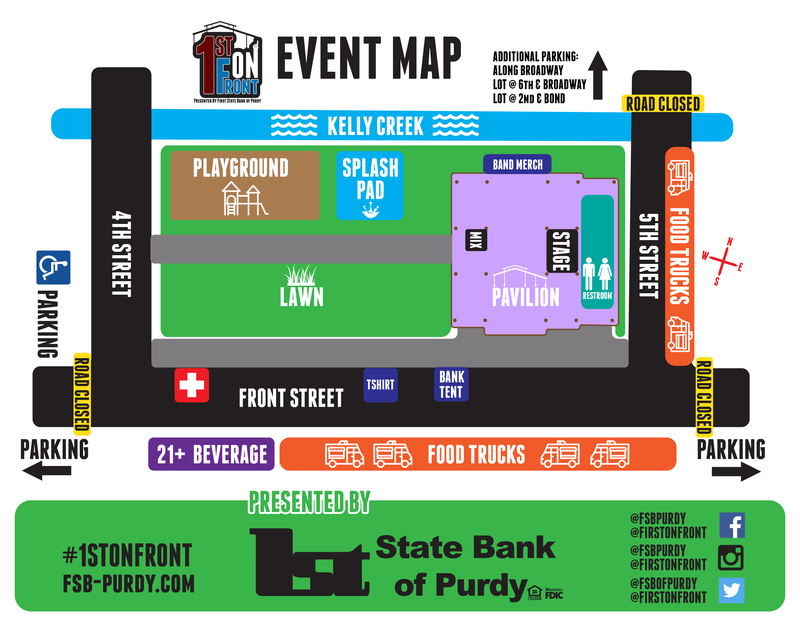 1ST ON FRONT is hosted in Downtown Monett Missouri at the Glen and Sharon Garrett Downtown Park on Front Street between 4th and 5th streets. The main stage is located beneath the 8,000-square-foot covered Jerry D. Hall Memorial Pavilion facing a large outdoor space. Food trucks will be setup along 5th and Front streets and traffic will be blocked on Front street and 5th street near the event. Free parking is available in lots to the southwest and east sides of the event. Additional parking is available along Broadway street, a parking lot at 6th street and Broadway street, and an additional parking lot at 2nd street and Bond street. Visit our Vendor Info page for more information. Follow us on Facebook, Twitter, and Instagram @FIRSTONFRONT to hear about all of our exciting plans and event news. Also be sure to follow our official First State Bank pages @FSBPURDY on Facebook & Instagram and @FSBofPURDY on Twitter. Please send inquires regarding 1ST ON FRONT to firstonfront@fsb-purdy.com or call us at (800) 391-2535.